Hope everyone had a great long weekend, those of us who had to stay in Perth were still treated to some awesome sunsets. I figured that since everything was so still that I would head down to the beach and capture some silky smooth water. Capturing seascapes would have to be my favourite as they are so relaxing, you get to listen to the calming waves lapping against the rocks and I always feel recharged after coming home from one of these shoots. Did anyone else get out and about this weekend and get some great shots? This entry was posted in Australian Landscapes, Australian Seascapes, Perth Photos, Sunset Photos and tagged australia, beach, canon, Jamie Paterson, landscape, long exposure, ocean, seascape, sunset, surf, waves, western australia. it was an incredible band of colour on the horizon wasn’t it. nice storms rolling on in where i was too. did you shoot any of the lightning?? i was out near Rockingham and saw some wicked clouds up to the North. was expecting you boys to have some nice big storm clouds in your shots. maybe it wasn’t quite as far north as what I thought. Nice water, and great colours in the sky! However, I got the test results on Saturday evening, indicating I didn’t have swine flu. However, I still made the most of my Saturday….and spent some time taking photos of water droplets – check my blog for photos. Really nice, mate. The sky is awesome. 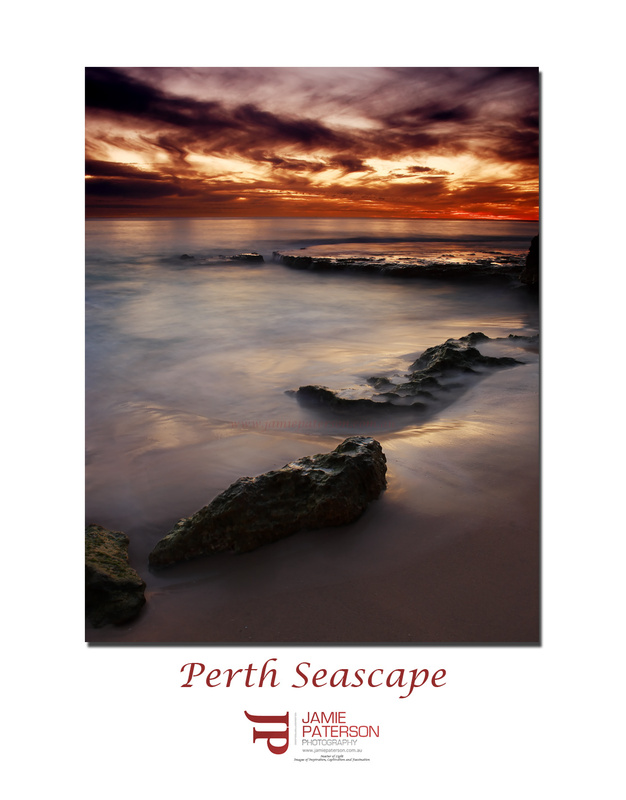 I can’t wait to get back to Perth and shoot some sunsets over the ocean! I finally went out this weekend and took some fresh shots. Will be posting them on my blog over the next week or so. This is great Jamie. The colors of the sky are wonderfully fiery. I got out and caught some 4WDers drifting in a pit of shallow mud. That sure was fun! It was really cool, wish I was out tonight shooting the lighting. I didn’t see any lighting when I was out on Saturday night. I’m glad you’re well. I’ll check out your water droplet shots now. When you coming back to Perth? Thanks for the compliments. Look forward to seeing your new shots, you’re always coming up with great stuff. Thanks for the great comments. I’ll have to check out your photos. Great shot Jamie, we sure have had some interesting sunsets over the last few days. Just posted an image on my blog from last night, bit of a stormy one but the colours were amazing. Still processing a few more from over the weekend but try as I might the lightning shots eluded me, it seemed that which ever way I pointerd the camera the lightning was the other way.